You want to sound like the voice actors of famous game Overwatch. You just have to download Voicemos for free, the best modulator with sound effects and voice acting so that when you speak you sound like Reaper, Genji, Hero, Zenyatta, Doomfist, Moira, Winston, Tracer, Junkrat, Orisa or Athena. The best free app for trolling in Overwatch voice chat is Voicemod! Feedback and Support: Contact us here. How to get Overwatch Voice Changer? Very easy. If you want to sound like the voice acting actors of the main Overwatch characters like Reaper, Genji, Hero, Zenyatta, Doomfist, Moira, Winston, Tracer, Junkrat, Orisa or Athena, the best thing you can do is download free Install Voicemod, the best voice changer, generator and mic modulator with audio effects. Once the voice modifier is installed on your PC you can select between the voices already designed or, if you are a PRO user, you can create your own voice messages with the Voice Maker. Download, install & open Voicemod Voice Changer App. 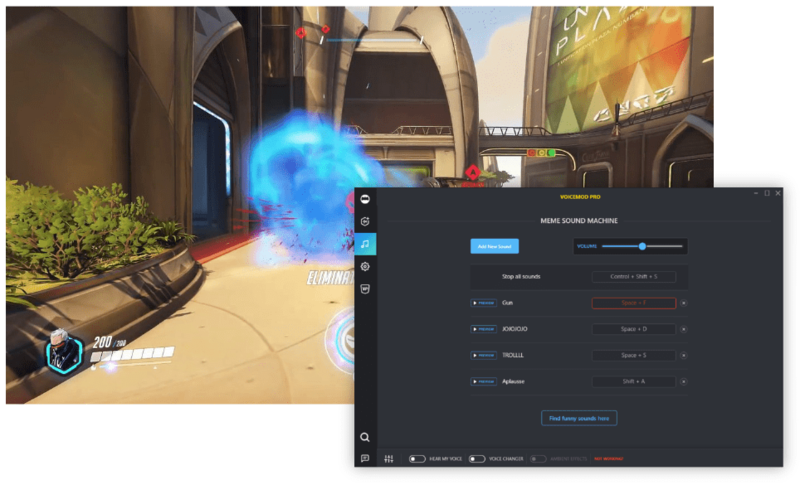 Select the inputs and outputs of your headset to use the Voice Changer in Overwatch. Open your System Audio Settings & configure Microphone (Voicemod Virtual Audio Device (WDM)) as Default Microphone. Remember, when you don't want to use Voicemod app to transform your voice in your streaming/communication audio chat or game, you have to set your real microphone as your input device again. 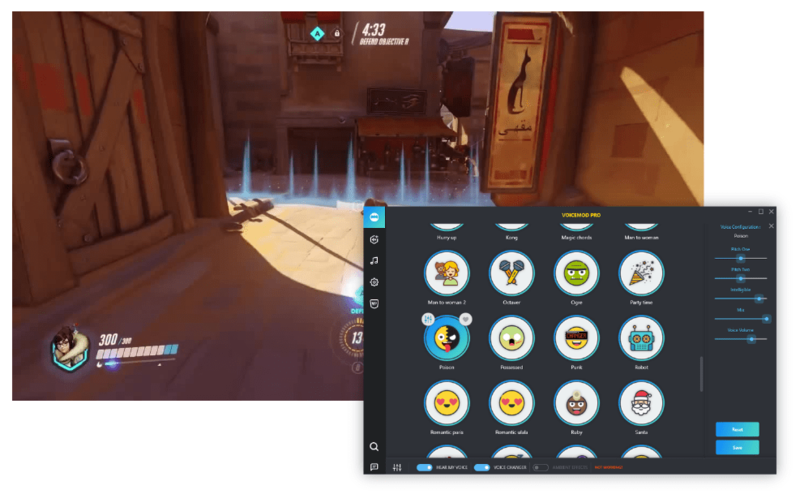 Voicemod can also function as a soundboard in Overwatch with which to reject samples of game characters (Reaper, Genji, Hero, Zenyatta, Doomfist, Moira, Winston, Tracer, Junkrat, Orisa or Athena), audio memes or music samples. Etos audio files can be heard through the voice chat of the game and with them you can trolling your friends. Voicemod is a perfect Soundboard for Overwatch, since it is integrated with the voice changer and allows you to play shortcuts audio samples through your mic signal. Install, execute and configure Voicemod correctly on your PC. Open your System Audio Settings & configure Microphone (Voicemod Virtual Audio Device (WDM)) as Default Microphone. With this, any sound played on the Voicemod Soundboard will sound in overwatch voice chat. Access the Memo Sound Machine section of Voicemod and select the audio files you want to use in the online game. Assign keyboard shortcuts to each sound. 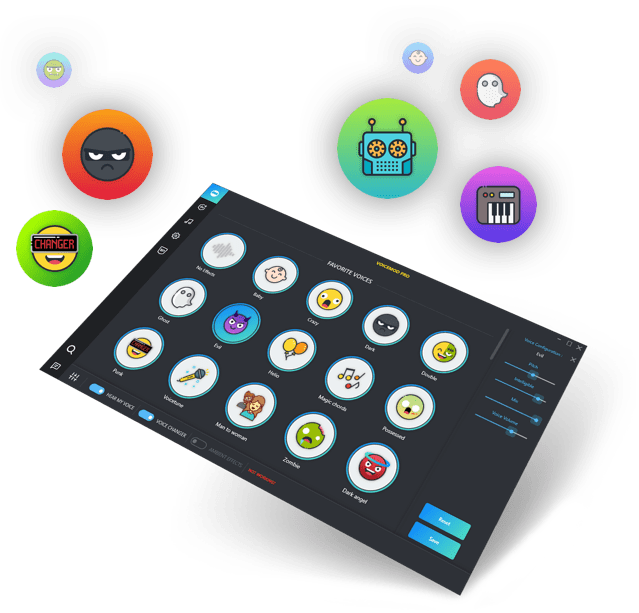 Access Overwatch and enjoy the soundboard in your online games such as Voicemod's Meme Sound Machine.